Bud Glasgow graduated from Northeast Louisiana State College in 1965 with a Bachelor of Science degree in Pharmacy. 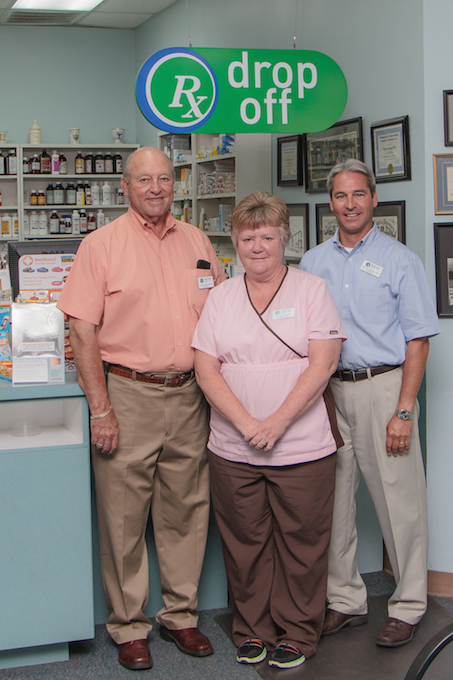 Bud worked as a staff pharmacist for Thrift Drugs in Covington, Louisiana for 4 years. In 1969 Bud opened Thrift-Town Pharmacy in Amite, Louisiana on Hwy 16 (the current Mike’s Catfish Inn building). In 1978 Bud purchased Medi-Thrift Pharmacy and relocated Thrift-Town Pharmacy into Tangilena Village Shopping Center. In 1995, he moved the pharmacy into its present location in Tycer Park Plaza, across from Hood Memorial Hospital. In 1995 he also opened Vital Care Home Infusion Services, Inc. located within Thrift-Town Pharmacy. In 1998 he attended PCCA (Professional Prescription Compounding Centers of America) and became a compounding pharmacist. Bud is a member of National Community Pharmacists Association, Louisiana Pharmacists Association and Louisiana Independent Pharmacies Association. He is married to Carroll Kent Glasgow and they have four children. Ray Glasgow graduated from Northeast Louisiana University in 1988 with a Bachelor of Science degree in Pharmacy. Ray worked as a staff pharmacist at St. Francis Medical Center in Monroe, Louisiana for 5 years. In 1993 Ray moved to Amite to work as a staff pharmacist for his Dad at Thrift-Town Pharmacy. Ray attended Vital Care Home Infusion Training in 1995 and opened Vital Care Home Infusion Services, Inc. within Thrift-Town Pharmacy. He obtained his certification in Pharmacy Based Immunizations in 2010. Ray is a member of National Community Pharmacist Association, Louisiana Pharmacists Association and Louisiana Independent Pharmacies Associations. Ray is married to Piper Graham Glasgow and they have three children. Velvet Lopinto graduated from Northeast Louisiana University in 1984 with a Bachelor of Science degree in Pharmacy. Velvet worked as a staff pharmacist at Baton Rouge General in Baton Rouge, Louisiana for 21 years. In 1996 Velvet came to work as a full time staff pharmacist for Thrift-Town Pharmacy. She attended PCCA (Professional Prescription Compounding Centers of America) training and became a compounding pharmacist in 1998. She obtained her certification in Pharmacy Based Immunizations in 2012. Velvet is a member of the American Pharmacists Association. Velvet is married to Joe Lopinto and has two children.